Organic chemistry is a subdiscipline of chemistry that studies the structure, properties and reactions of organic compounds, which contain carbon in covalent bonding. Study of structure determines their chemical composition and formula. Study of properties includes physical and chemical properties, and evaluation of chemical reactivity to understand their behavior. The study of organic reactions includes the chemical synthesis of natural products, drugs, and polymers, and study of individual organic molecules in the laboratory and via theoretical (in silico) study. The range of chemicals studied in organic chemistry includes hydrocarbons (compounds containing only carbon and hydrogen) as well as compounds based on carbon, but also containing other elements, especially oxygen, nitrogen, sulfur, phosphorus (included in many biochemicals) and the halogens. Organometallic chemistry is the study of compounds containing carbon–metal bonds. In addition, contemporary research focuses on organic chemistry involving other organometallics including the lanthanides, but especially the transition metals zinc, copper, palladium, nickel, cobalt, titanium and chromium. Organic compounds form the basis of all earthly life and constitute the majority of known chemicals. The bonding patterns of carbon, with its valence of four—formal single, double, and triple bonds, plus structures with delocalized electrons—make the array of organic compounds structurally diverse, and their range of applications enormous. They form the basis of, or are constituents of, many commercial products including pharmaceuticals; petrochemicals and agrichemicals, and products made from them including lubricants, solvents; plastics; fuels and explosives. The study of organic chemistry overlaps organometallic chemistry and biochemistry, but also with medicinal chemistry, polymer chemistry, and materials science. 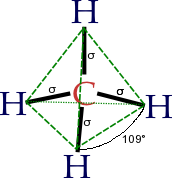 Methane, CH4; the line-angle structural formula shows four carbon-hydrogen single bonds (σ, in black), and the typical 3D shape of tetrahedral molecules, with ~109° interior bond angles (in dashed-green). Before the nineteenth century, chemists generally believed that compounds obtained from living organisms were endowed with a vital force that distinguished them from inorganic compounds. According to the concept of vitalism (vital force theory), organic matter was endowed with a "vital force". During the first half of the nineteenth century, some of the first systematic studies of organic compounds were reported. Around 1816 Michel Chevreul started a study of soaps made from various fats and alkalis. He separated the different acids that, in combination with the alkali, produced the soap. Since these were all individual compounds, he demonstrated that it was possible to make a chemical change in various fats (which traditionally come from organic sources), producing new compounds, without "vital force". In 1828 Friedrich Wöhler produced the organic chemical urea (carbamide), a constituent of urine, from inorganic starting materials (the salts potassium cyanate and ammonium sulfate), in what is now called the Wöhler synthesis. Although Wöhler himself was cautious about claiming he had disproved vitalism, this was the first time a substance thought to be organic was synthesized in the laboratory without biological (organic) starting materials. The event is now generally accepted as indeed disproving the doctrine of vitalism. In 1856 William Henry Perkin, while trying to manufacture quinine accidentally produced the organic dye now known as Perkin's mauve. His discovery, made widely known through its financial success, greatly increased interest in organic chemistry. A crucial breakthrough for organic chemistry was the concept of chemical structure, developed independently in 1858 by both Friedrich August Kekulé and Archibald Scott Couper. Both researchers suggested that tetravalent carbon atoms could link to each other to form a carbon lattice, and that the detailed patterns of atomic bonding could be discerned by skillful interpretations of appropriate chemical reactions. The era of the pharmaceutical industry began in the last decade of the 19th century when the manufacturing of acetylsalicylic acid—more commonly referred to as aspirin—in Germany was started by Bayer. By 1910 Paul Ehrlich and his laboratory group began developing arsenic-based arsphenamine, (Salvarsan), as the first effective medicinal treatment of syphilis, and thereby initiated the medical practice of chemotherapy. Ehrlich popularized the concepts of "magic bullet" drugs and of systematically improving drug therapies. His laboratory made decisive contributions to developing antiserum for diphtheria and standardizing therapeutic serums. An example of an organometallic molecule, a catalyst called Grubbs' catalyst. Its formula is often given as RuCl2(PCy3)2(=CHPh), where the ball-and-stick model is based on X-ray crystallography. The single metal atom ruthenium (Ru), (in turquoise), is at the very center of the structure; two chlorines (green), are bonded to the ruthenium atom—carbon atoms are black, hydrogens gray-white, and phosphorus orange. A phosphorus-ligand bond, tricyclohexyl phosphine, PCy, is below center; (another PCy ligand appears at the top of the image where its rings are obscuring one another). The ring group projecting to the right, an alkylidene, contains a metal-carbon double bond to ruthenium. Early examples of organic reactions and applications were often found because of a combination of luck and preparation for unexpected observations. The latter half of the 19th century however witnessed systematic studies of organic compounds. The development of synthetic indigo is illustrative. The production of indigo from plant sources dropped from 19,000 tons in 1897 to 1,000 tons by 1914 thanks to the synthetic methods developed by Adolf von Baeyer. In 2002, 17,000 tons of synthetic indigo were produced from petrochemicals. In the early part of the 20th century, polymers and enzymes were shown to be large organic molecules, and petroleum was shown to be of biological origin. The multiple-step synthesis of complex organic compounds is called total synthesis. Total synthesis of complex natural compounds increased in complexity to glucose and terpineol. For example, cholesterol-related compounds have opened ways to synthesize complex human hormones and their modified derivatives. Since the start of the 20th century, complexity of total syntheses has been increased to include molecules of high complexity such as lysergic acid and vitamin B12. The total synthesis of vitamin B12 marked a major achievement in organic chemistry. The discovery of petroleum and the development of the petrochemical industry spurred the development of organic chemistry. Converting individual petroleum compounds into different types of compounds by various chemical processes led to organic reactions enabling a broad range of industrial and commercial products including, among (many) others: plastics, synthetic rubber, organic adhesives, and various property-modifying petroleum additives and catalysts. The majority of chemical compounds occurring in biological organisms are in fact carbon compounds, so the association between organic chemistry and biochemistry is so close that biochemistry might be regarded as in essence a branch of organic chemistry. Although the history of biochemistry might be taken to span some four centuries, fundamental understanding of the field only began to develop in the late 19th century and the actual term biochemistry was coined around the start of 20th century. Research in the field increased throughout the twentieth century, without any indication of slackening in the rate of increase, as may be verified by inspection of abstraction and indexing services such as BIOSIS Previews and Biological Abstracts, which began in the 1920s as a single annual volume, but has grown so drastically that by the end of the 20th century it was only available to the everyday user as an online electronic database. Since organic compounds often exist as mixtures, a variety of techniques have also been developed to assess purity, especially important being chromatography techniques such as HPLC and gas chromatography. Traditional methods of separation include distillation, crystallization, and solvent extraction. Nuclear magnetic resonance (NMR) spectroscopy is the most commonly used technique, often permitting complete assignment of atom connectivity and even stereochemistry using correlation spectroscopy. The principal constituent atoms of organic chemistry – hydrogen and carbon – exist naturally with NMR-responsive isotopes, respectively 1H and 13C. Elemental analysis: A destructive method used to determine the elemental composition of a molecule. See also mass spectrometry, below. Mass spectrometry indicates the molecular weight of a compound and, from the fragmentation patterns, its structure. High resolution mass spectrometry can usually identify the exact formula of a compound and is used in lieu of elemental analysis. In former times, mass spectrometry was restricted to neutral molecules exhibiting some volatility, but advanced ionization techniques allow one to obtain the "mass spec" of virtually any organic compound. Crystallography can be useful for determining molecular geometry when a single crystal of the material is available. Highly efficient hardware and software allows a structure to be determined within hours of obtaining a suitable crystal. Traditional spectroscopic methods such as infrared spectroscopy, optical rotation, and UV/VIS spectroscopy provide relatively nonspecific structural information but remain in use for specific classes of compounds. Traditionally refractive index and density were also important for substance identification. Organic compounds typically melt and many boil. In contrast, while inorganic materials generally can be melted, many do not boil, tending instead to degrade. In earlier times, the melting point (m.p.) and boiling point (b.p.) provided crucial information on the purity and identity of organic compounds. The melting and boiling points correlate with the polarity of the molecules and their molecular weight. Some organic compounds, especially symmetrical ones, sublime, that is they evaporate without melting. A well-known example of a sublimable organic compound is para-dichlorobenzene, the odiferous constituent of modern mothballs. Organic compounds are usually not very stable at temperatures above 300 °C, although some exceptions exist. Neutral organic compounds tend to be hydrophobic; that is, they are less soluble in water than in organic solvents. Exceptions include organic compounds that contain ionizable (which can be converted in ions) groups as well as low molecular weight alcohols, amines, and carboxylic acids where hydrogen bonding occurs. Organic compounds tend to dissolve in organic solvents. Solvents can be either pure substances like ether or ethyl alcohol, or mixtures, such as the paraffinic solvents such as the various petroleum ethers and white spirits, or the range of pure or mixed aromatic solvents obtained from petroleum or tar fractions by physical separation or by chemical conversion. Solubility in the different solvents depends upon the solvent type and on the functional groups if present in the solution. Various specialized properties of molecular crystals and organic polymers with conjugated systems are of interest depending on applications, e.g. thermo-mechanical and electro-mechanical such as piezoelectricity, electrical conductivity (see conductive polymers and organic semiconductors), and electro-optical (e.g. non-linear optics) properties. For historical reasons, such properties are mainly the subjects of the areas of polymer science and materials science. Various names and depictions for one organic compound. The names of organic compounds are either systematic, following logically from a set of rules, or nonsystematic, following various traditions. Systematic nomenclature is stipulated by specifications from IUPAC. Systematic nomenclature starts with the name for a parent structure within the molecule of interest. This parent name is then modified by prefixes, suffixes, and numbers to unambiguously convey the structure. Given that millions of organic compounds are known, rigorous use of systematic names can be cumbersome. Thus, IUPAC recommendations are more closely followed for simple compounds, but not complex molecules. To use the systematic naming, one must know the structures and names of the parent structures. Parent structures include unsubstituted hydrocarbons, heterocycles, and monofunctionalized derivatives thereof. Nonsystematic nomenclature is simpler and unambiguous, at least to organic chemists. Nonsystematic names do not indicate the structure of the compound. They are common for complex molecules, which includes most natural products. Thus, the informally named lysergic acid diethylamide is systematically named (6aR,9R)-N,N-diethyl-7-methyl-4,6,6a,7,8,9-hexahydroindolo-[4,3-fg] quinoline-9-carboxamide. With the increased use of computing, other naming methods have evolved that are intended to be interpreted by machines. Two popular formats are SMILES and InChI. Organic molecules are described more commonly by drawings or structural formulas, combinations of drawings and chemical symbols. The line-angle formula is simple and unambiguous. In this system, the endpoints and intersections of each line represent one carbon, and hydrogen atoms can either be notated explicitly or assumed to be present as implied by tetravalent carbon. By 1880 an explosion in the number of chemical compounds being discovered occurred assisted by new synthetic and analytical techniques. Grignard described the situation as "chaos le plus complet" as due to the lack of convention it was possible to have multiple names for the same compound. This led to the creation of the Geneva rules in 1892. The family of carboxylic acids contains a carboxyl (-COOH) functional group. Acetic acid, shown here, is an example. The concept of functional groups is central in organic chemistry, both as a means to classify structures and for predicting properties. A functional group is a molecular module, and the reactivity of that functional group is assumed, within limits, to be the same in a variety of molecules. Functional groups can have decisive influence on the chemical and physical properties of organic compounds. Molecules are classified on the basis of their functional groups. Alcohols, for example, all have the subunit C-O-H. All alcohols tend to be somewhat hydrophilic, usually form esters, and usually can be converted to the corresponding halides. Most functional groups feature heteroatoms (atoms other than C and H). Organic compounds are classified according to functional groups, alcohols, carboxylic acids, amines, etc. alkenes (olefins): aliphatic hydrocarbons which contain one or more double bonds, i.e. di-olefins (dienes) or poly-olefins. alkynes (acetylenes): aliphatic hydrocarbons which have one or more triple bonds. The rest of the group is classed according to the functional groups present. Such compounds can be "straight-chain", branched-chain or cyclic. The degree of branching affects characteristics, such as the octane number or cetane number in petroleum chemistry. Both saturated (alicyclic) compounds and unsaturated compounds exist as cyclic derivatives. The most stable rings contain five or six carbon atoms, but large rings (macrocycles) and smaller rings are common. The smallest cycloalkane family is the three-membered cyclopropane ((CH2)3). Saturated cyclic compounds contain single bonds only, whereas aromatic rings have an alternating (or conjugated) double bond. Cycloalkanes do not contain multiple bonds, whereas the cycloalkenes and the cycloalkynes do. Benzene is one of the best-known aromatic compounds as it is one of the simplest and most stable aromatics. Aromatic hydrocarbons contain conjugated double bonds. This means that every carbon atom in the ring is sp2 hybridized, allowing for added stability. The most important example is benzene, the structure of which was formulated by Kekulé who first proposed the delocalization or resonance principle for explaining its structure. For "conventional" cyclic compounds, aromaticity is conferred by the presence of 4n + 2 delocalized pi electrons, where n is an integer. Particular instability (antiaromaticity) is conferred by the presence of 4n conjugated pi electrons. The characteristics of the cyclic hydrocarbons are again altered if heteroatoms are present, which can exist as either substituents attached externally to the ring (exocyclic) or as a member of the ring itself (endocyclic). In the case of the latter, the ring is termed a heterocycle. Pyridine and furan are examples of aromatic heterocycles while piperidine and tetrahydrofuran are the corresponding alicyclic heterocycles. The heteroatom of heterocyclic molecules is generally oxygen, sulfur, or nitrogen, with the latter being particularly common in biochemical systems. Heterocycles are commonly found in a wide range of products including aniline dyes and medicines. Additionally, they are prevalent in a wide range of biochemical compounds such as alkaloids, vitamins, steroids, and nucleic acids (e.g. DNA, RNA). Rings can fuse with other rings on an edge to give polycyclic compounds. The purine nucleoside bases are notable polycyclic aromatic heterocycles. Rings can also fuse on a "corner" such that one atom (almost always carbon) has two bonds going to one ring and two to another. Such compounds are termed spiro and are important in a number of natural products. One important property of carbon is that it readily forms chains, or networks, that are linked by carbon-carbon (carbon-to-carbon) bonds. The linking process is called polymerization, while the chains, or networks, are called polymers. The source compound is called a monomer. Two main groups of polymers exist: synthetic polymers and biopolymers. Synthetic polymers are artificially manufactured, and are commonly referred to as industrial polymers. Biopolymers occur within a respectfully natural environment, or without human intervention. Since the invention of the first synthetic polymer product, bakelite, synthetic polymer products have frequently been invented. Common synthetic organic polymers are polyethylene (polythene), polypropylene, nylon, teflon (PTFE), polystyrene, polyesters, polymethylmethacrylate (called perspex and plexiglas), and polyvinylchloride (PVC). Varieties of each synthetic polymer product may exist, for purposes of a specific use. Changing the conditions of polymerization alters the chemical composition of the product and its properties. These alterations include the chain length, or branching, or the tacticity. With a single monomer as a start, the product is a homopolymer. Secondary component(s) may be added to create a heteropolymer (co-polymer) and the degree of clustering of the different components can also be controlled. Physical characteristics, such as hardness, density, mechanical or tensile strength, abrasion resistance, heat resistance, transparency, colour, etc. will depend on the final composition. Biomolecular chemistry is a major category within organic chemistry which is frequently studied by biochemists. Many complex multi-functional group molecules are important in living organisms. Some are long-chain biopolymers, and these include peptides, DNA, RNA and the polysaccharides such as starches in animals and celluloses in plants. The other main classes are amino acids (monomer building blocks of peptides and proteins), carbohydrates (which includes the polysaccharides), the nucleic acids (which include DNA and RNA as polymers), and the lipids. In addition, animal biochemistry contains many small molecule intermediates which assist in energy production through the Krebs cycle, and produces isoprene, the most common hydrocarbon in animals. Isoprenes in animals form the important steroid structural (cholesterol) and steroid hormone compounds; and in plants form terpenes, terpenoids, some alkaloids, and a class of hydrocarbons called biopolymer polyisoprenoids present in the latex of various species of plants, which is the basis for making rubber. In pharmacology, an important group of organic compounds is small molecules, also referred to as 'small organic compounds'. In this context, a small molecule is a small organic compound that is biologically active, but is not a polymer. In practice, small molecules have a molar mass less than approximately 1000 g/mol. Fullerenes and carbon nanotubes, carbon compounds with spheroidal and tubular structures, have stimulated much research into the related field of materials science. The first fullerene was discovered in 1985 by Sir Harold W. Kroto of the United Kingdom and by Richard E. Smalley and Robert F. Curl, Jr., of the United States. Using a laser to vaporize graphite rods in an atmosphere of helium gas, these chemists and their assistants obtained cagelike molecules composed of 60 carbon atoms (C60) joined together by single and double bonds to form a hollow sphere with 12 pentagonal and 20 hexagonal faces—a design that resembles a football, or soccer ball. In 1996 the trio was awarded the Nobel Prize for their pioneering efforts. The C60 molecule was named buckminsterfullerene (or, more simply, the buckyball) after the American architect R. Buckminster Fuller, whose geodesic dome is constructed on the same structural principles. Organic compounds containing bonds of carbon to nitrogen, oxygen and the halogens are not normally grouped separately. Others are sometimes put into major groups within organic chemistry and discussed under titles such as organosulfur chemistry, organometallic chemistry, organophosphorus chemistry and organosilicon chemistry. where X is some functional group and Nu is a nucleophile. Strategies to design a synthesis include retrosynthesis, popularized by E.J. Corey, which starts with the target molecule and splices it to pieces according to known reactions. The pieces, or the proposed precursors, receive the same treatment, until available and ideally inexpensive starting materials are reached. Then, the retrosynthesis is written in the opposite direction to give the synthesis. A "synthetic tree" can be constructed, because each compound and also each precursor has multiple syntheses. ^ a b c Clayden, J.; Greeves, N. and Warren, S. (2012) Organic Chemistry. Oxford University Press. pp. 1–15. ISBN 0-19-927029-5. ^ Kiefer, D. M. (1993). "Organic Chemicals' Mauve Beginning". Chem. Eng. News. 71 (32): 22–23. doi:10.1021/cen-v071n032.p022. ^ "August Kekulé and Archibald Scott Couper". Science History Institute. June 2016. Retrieved 20 March 2018. ^ Streitwieser, Andrew; Heathcock, Clayton H.; Kosower, Edward M. (2017). Introduction to Organic Chemistry. New Delhipages=3–4: Medtech (Scientific International, reprint of revised 4th edition, Macmillan, 1998). ISBN 978-93-85998-89-8. ^ "Paul Ehrlich, the Rockefeller Institute, and the first targeted chemotherapy". Rockefeller University. Retrieved 3 Aug 2012. ^ "Paul Ehrlich". Science History Institute. June 2016. Retrieved 20 March 2018. ^ Torker, Sebastian; MüLler, Andre; Sigrist, Raphael; Chen, Peter (2010). "Tuning the Steric Properties of a Metathesis Catalyst for Copolymerization of Norbornene and Cyclooctene toward Complete Alternation". Organometallics. 29 (12): 2735–2751. doi:10.1021/om100185g. ^ Nicolaou, K.C. ; Sorensen, E.J. (1996). Classics in Total Synthesis: Targets, Strategies, Methods. Wiley. ISBN 978-3-527-29231-8. ^ Evieux, E. A. (1954-06-01). "The Geneva Congress on Organic Nomenclature, 1892". Journal of Chemical Education. 31 (6): 326. Bibcode:1954JChEd..31..326E. doi:10.1021/ed031p326. ISSN 0021-9584. Alkyl sulfonates are esters of alkane sulfonic acids with the general formula R-SO2-O-R'. They act as alkylating agents, some of them are used as alkylating antineoplastic agents in the treatment of cancer, e.g. Busulfan. The BP Professorship of Organic Chemistry is one of the senior professorships at the University of Cambridge, based in the Department of Chemistry. The Beilstein database is the largest database in the field of organic chemistry, in which compounds are uniquely identified by their Beilstein Registry Number. The database covers the scientific literature from 1771 to the present and contains experimentally validated information on millions of chemical reactions and substances from original scientific publications. The electronic database was created from Beilstein's Handbook of Organic Chemistry, founded by Friedrich Konrad Beilstein in 1881, but has appeared online under a number of different names, including Crossfire Beilstein. Since 2009, the content has been maintained and distributed by Elsevier Information Systems in Frankfurt under the product name "Reaxys".The database contains information on reactions, substances, structures and properties. Up to 350 fields containing chemical and physical data (such as melting point, refractive index etc.) are available for each substance. References to the literature in which the reaction or substance data appear are also given. Bioorganic chemistry is a rapidly growing scientific discipline that combines organic chemistry and biochemistry. While biochemistry aims at understanding biological processes using chemistry, bioorganic chemistry attempts to expand organic-chemical researches (that is, structures, synthesis, and kinetics) toward biology. When investigating metalloenzymes and cofactors, bioorganic chemistry overlaps bioinorganic chemistry. Biophysical organic chemistry is a term used when attempting to describe intimate details of molecular recognition by bioorganic chemistry.Bioorganic chemistry is that branch of life science that deals with the study of biological processes using chemical methods. In chemical nomenclature, the IUPAC nomenclature of organic chemistry is a systematic method of naming organic chemical compounds as recommended by the International Union of Pure and Applied Chemistry (IUPAC). It is published in the Nomenclature of Organic Chemistry (informally called the Blue Book). Ideally, every possible organic compound should have a name from which an unambiguous structural formula can be created. There is also an IUPAC nomenclature of inorganic chemistry. To avoid long and tedious names in normal communication, the official IUPAC naming recommendations are not always followed in practice, except when it is necessary to give an unambiguous and absolute definition to a compound. IUPAC names can sometimes be simpler than older names, as with ethanol, instead of ethyl alcohol. For relatively simple molecules they can be more easily understood than non-systematic names, which must be learnt or looked up. However, the common or trivial name is often substantially shorter and clearer, and so preferred. These non-systematic names are often derived from an original source of the compound. In addition, very long names may be less clear than structural formulae. In chemistry, isomers are ions or molecules with identical formulas but distinct structures. Isomers do not necessarily share similar properties. Two main forms of isomerism are structural isomerism (or constitutional isomerism) and stereoisomerism (or spatial isomerism). In organic chemistry, a moiety () is a part of a molecule which is typically given a name as it can be found within other kinds of molecules as well. In chemistry, an organic compound is generally any chemical compound that contains carbon. Due to carbon's ability to catenate (form chains with other carbon atoms), millions of organic compounds are known. Study of the properties and synthesis of organic compounds is the discipline known as organic chemistry. For historical reasons, a few classes of carbon-containing compounds (e.g., carbonates and cyanides), along with a handful of other exceptions (e.g., carbon dioxide), are not classified as organic compounds and are considered inorganic. No consensus exists among chemists on precisely which carbon-containing compounds are excluded, making the definition of an organic compound elusive.Although organic compounds make up only a small percentage of the Earth's crust, they are of central importance because all known life is based on organic compounds. Living things incorporate inorganic carbon into organic compounds through a network of processes (the carbon cycle) that begins with the conversion of carbon dioxide and a hydrogen source like water into simple sugars and other organic molecules by autotrophic organisms using light (photosynthesis) or other sources of energy. Most synthetically produced organic compounds are ultimately derived from petrochemicals consisting mainly of hydrocarbons, which are themselves formed from the high pressure and temperature degradation of organic matter underground over geological timescales. This ultimate derivation notwithstanding, organic compounds are no longer defined as compounds originating in living things, as they were historically. Organic chemistry – scientific study of the structure, properties, composition, reactions, and preparation (by synthesis or by other means) of carbon-based compounds, hydrocarbons, and their derivatives. These compounds may contain any number of other elements, including hydrogen, nitrogen, oxygen, the halogens as well as phosphorus, silicon, and sulfur. A reagent is a substance or compound added to a system to cause a chemical reaction, or added to test if a reaction occurs. The terms reactant and reagent are often used interchangeably—however, a reactant is more specifically a substance consumed in the course of a chemical reaction. Solvents, though involved in the reaction, are usually not called reactants. Similarly, catalysts are not consumed by the reaction, so they are not reactants. In biochemistry, especially in connection with enzyme-catalyzed reactions, the reactants are commonly called substrates. In chemistry, saturation (from the Latin word saturare, meaning 'to fill') has diverse meanings, all based on the idea of reaching a maximum capacity. In organic chemistry and biochemistry, a side chain is a chemical group that is attached to a core part of the molecule called the "main chain" or backbone. The side chain is a hydrocarbon branching element of a molecule that is attached to a larger hydrocarbon backbone. It is one factor in determining a molecule's properties and reactivity. A side chain is also known as a pendant chain, but a pendant group (side group) has a different definition.